So, hopefully, you’ve gotten your hands dirty with our vegan recipe for making seitan from scratch. Here’s some additional info to ensure your recipe comes out well! I’ve had a lot of variation over time with the consistency of my seitan. Sometimes it is very crumbly and moist and other times it is very solid. Many variables come from what kind of flour you use. I’ve used cheap Pillsbury flour with excellent results and organic wheat flour purchased from a Mennonite farm with poor results. Perhaps there is a better flour to use, but I’ve had varying results with similar flours. You can also grind down wheat berries. If you don’t have a grain mill, as I don’t, you can use a coffee grinder! Patience is always the best tool! I don’t suggest skipping the step of making a dough and make sure to rinse the dough long enough to get out all the starch. If you’re cooked seitan is super moist and crumbly. Just crumble or slice it into a pan and throw it under the broiler or bake in oven, flipping it around occasionally until it hardens up a bit. Remember, these instructions above are just guidelines. Feel free to deviate and experiment. If your seitan doesn’t turn out exactly how you want, get creative to figure out how to solve the problem. I’ve been making seitan for 7 years and I am still experimenting. It may be a bit time consuming, but its never boring! OK, so I know this is slow food for FAST living. So maybe you don’t have time, and would like the more albeit more expensive. Here is a great step by step with vital wheat gluten courtesy of Vegan Lunchcast. Ok, these are a bunch of vegan sites, because Vegans know how to cook Seitan best. But the good news is, you don’t have to be vegan to enjoy seitan. Although it is a meat substitute, even if you are as excited about eating meat as I am, you can still enjoy seitan. Its not one or the other people (unless of course you’re vegan). Hooray for emphasizing that omnivores can Also enjoy veggie cuisine. I love any food that tastes good and makes you feel good. 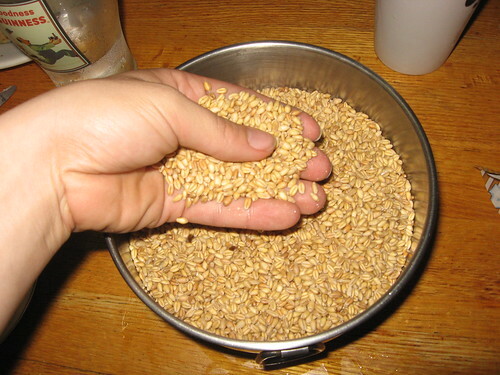 You can grind wheat berries. I’ve found its easier the finer the grind. The more course it is, the harder it is to separate the gluten. I was wondering …… vital wheat gluten you can add spices and such to the flour before you stir it up and cook it…….. i love this process because it is quick….. however, I had considered adding spices to regular flour to make my wheat meat but had reservations as you have to wash out the starch. Will any spices and other flavorings added to the flour before it is washed…….. will those spices be washed away in the rinsing of the starch? Would you add spices as I had mentioned to your wheat meat as I had described. I have not seen any one do this when it is made from scratch. The spices will all just flush out when you rinse the flour. I suggest spicing it after you have your gluten, when you cook it in the stock for flavor.